Both Raiders and MetroStars see Monday’s Round 5 South Australia PlayStation4 National Premier League encounter at the Croatian Sports Centre as a must win game to get their respective campaigns running. Raiders were on the wrong end of a thrilling contest with Para Hills on Friday, losing 4-3. It continued a winless start to 2015, with only one point collected in three matches. Coach Carl Maynard was incensed with the defeat. “I can’t believe we lost. We were naive defensively and paid for it, but good going forward. It’s disappointing,” he said. “Results are concerning in that we are not getting the points. Our performances, with the exception of our defensive efforts, have been good. We have a few issues to fix at the back. Raiders suffered dual losses against MetroStars in 2014 and another loss would leave them near the foot of the table. Maynard says he is looking forward to a match between two sides who look to control possession. “It’s a big game on two fronts – one, we need points, and the other it’s MetroStars. “Both teams haven’t started too well and will be looking for a win. Hopefully we can get on top of them. MetroStars were held to a second consecutive draw on Saturday, needing an equaliser inside the final 10 minutes from Steven Grelli to grab a share of the spoils with West Torrens Birkalla. Perry Mitris says MetroStars are not too worried despite a stuttering start to the campaign. “It was a disappointing result, I thought we could have got more than a draw,” the attacker noted. “We are not too concerned because MetroStars never starts off too well. We tend to pick up form as the season progresses. There are no panic stations on our part. 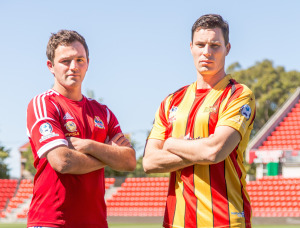 MetroStars are currently mid-table, with only one win and three goals to their name from the opening four rounds. They face a Raiders side equally desperate to gain a victory and Mitris says that will make for an intriguing battle. “I think the results will come with added confidence. Once we start scoring goals we can get the ball rolling. We are creating chances but must be more clinical in the final third. “It’s a must win against Raiders. They are a good side and will be tough to beat.